Share your story of how you have made the most of your PMP. I hear from PMP’s from all over the world several times a week (most have gone through Cheetah Learning) and they share with me how they have used their credential over the years. I thought it might be informative to share those stories here (as we do all learn from each other). For me, the PMP changed my business life in some remarkable ways. I had been an entrepreneur for 15 years before I became a PMP. After I became a PMP in 2001, it was like I became an entrepreneur on steroids as then I had more discipline to the follow the processes required to be a more successful entrepreneur. Becoming a PMP changed my thought patterns in some significant ways – as I looked at everything I was doing through the lens of IPECC (Initiation, Planning, Execution, Control and Closeout). Where was I with my projects, what did I need to do to keep them moving through to the closeout phase to what had I learned I could use on my future projects – even if the project didn’t quite turn out as I had expected. This last part has been a critical reflection activity as being an entrepreneur, I can generate a gazillion ideas a minute. The challenge is always, which of these ideas to pursue. I now have extensive opportunity scan processes (we teach these in the Cheetah Leadership Program). These opportunity scan processes are a way to incorporate lessons learned from previous projects into what we are considering doing today. What was the most significant change for you with becoming a PMP? How does being a PMP change the way you move through the world today? 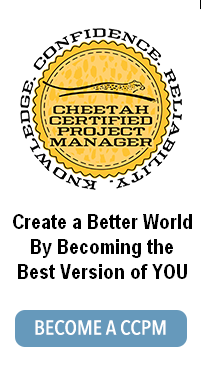 What about becoming a PMP with Cheetah Learning has stuck with you? How have you influenced those around you by being a PMP? What have you done to keep your PMP in good standing?